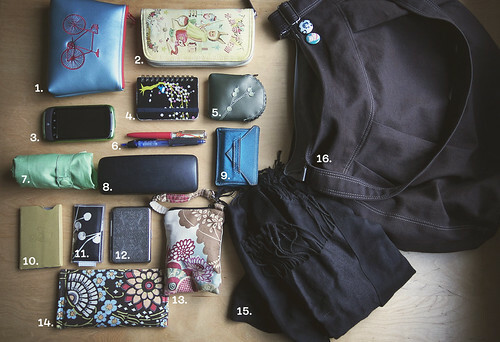 I did the "What's in Your Bag" thing once a few years ago, and I had been meaning to do it again and then someone gave me the perfect excuse. Way more stuff than I actually NEED to be carrying with me every day, but man am I prepared when someone needs something random like floss or a tiny screwdriver to repair glasses (I forgot to mention there's one in the little blue bag). Also, I didn't realize I'm a walking Etsy advert...yay for handmade!